Lingaa Movie Review exclusively at cinediary . Superstar Rajinikanth is back with his Padayappa director KS Ravikumar. Lets see if the duo break all the box office records with Lingaa. Lingaa begins on a flashback mode with an engineer played by Ponvannan surveying a dam of Solaiyur Village. Suspiciously, he is subjected to death the same day and is believed to be an accident by the localities. Story comes back to the present day, where Villagers are in search of late collector Raja Lingeswaran's [Rajinikanth] grandson to open a Temple that is kept closed for nearly 70 years. Lingaa [Rajinikanth], a pretty thief enters the village for the precious and fortunate idol. Later he comes to know that his grandfather Raja Lingeswaran who is a cambridge graduated engineer by education puts in his own money in constructing the dam and unfortunately disgraced by the villagers and sent out of the village. Will Lingaa bring home the bacon? Will they succeed solving their problems re-constructing dam? Forms the crux of Lingaa. Superstar Rajinikanth is back with bang. He has carried the whole film on his shoulders. He has shown a great difference in both of his roles. His comic timing and his be-friendly performance with youngsters Santhanam and Karunakaran needs a special mention. Sonakshi Sinha and Anushka are glamorous in their roles. Anushka steals the show as gorgeous looking journalist Lakshmi and Lingaa is a steller debut for Sonakshi. Santhanam, Karunakaran, Balaji have lived their roles as side kicks to Rajinikanth. Jagapathi Babu is apt as corrupt politician. King of Commercials, director KS Ravikumar has live up to the expectations of Rajini fans. He is sure to add Lingaa to his hit list. Though the script is not so new to universal cinema lovers, it has all that Superstar fans expect from a Thalaivar film. His mannerisms, one liners, stunts, dances what not. Ace film maker had to be complemented for bringing up such a fine picture with top technicians within six months. Producers Munirathna and Rockline Venkatesh also takes the credits for the same. Charbuster songs composed by AR Rahman are visually mind blowing. Randy aka Rathnavelu's cinematography is an absolute treat. At the same time graphics could have been much better, especially in the train and climax scenes. Editing is crisp. No frame makes you feel bored, even if the pace of the film is slow in first few minutes. Lingaa has all the necessary elements of a blockbuster commercial Indian cinema. Off them all, it has Thalaiva-Superstar-Rajinikanth in it. 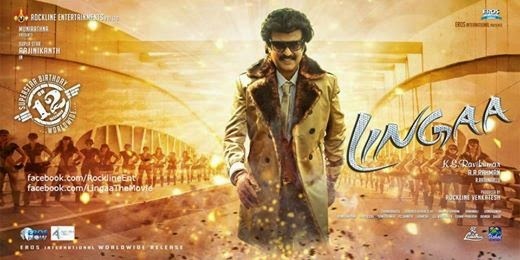 Though Lingaa seems like an adaption from Mega star Chiranjeevi's Indra and recently released Nikhi's Karthikeya, partially, it is unique in its own way. Dialogues like "I have not failed. I have just postponed my success... See you soon!" bring the house down. The superhit combo of KS Ravikumar and Rajinikanth will never let you down.